This presentation is designed to introduce you to the Block on Board (BOB). BOB dies give you the ability to cut an entire block from a single die. This saves even more time when creating a quilt top or other projects. It is perfect for the beginning quilters or new to the GO! who might be intimidated by the cutting process. For those who have been using the GO! system for years, this presentation a whole new world of possibilities. Attendees should have participated in the Cut Time. Quilt More. event before registering. There?s A Die For That LECTURE Ever looked at a pattern not written to be die cut and wished you knew what GO! Dies to use? Come learn how to ?translate? that pattern and take advantage of the speed, ease and accuracy of the GO! Fabric Cutting System! Learn firsthand how easy it is to look at a quilt or pattern and say ?there?s a die for that!? Be prepared to take on some fun, new projects after this class ? inspiring samples will help show you the way! Come learn what the GO! Fabric Cutting System is all about. You"ll learn tips and techniques for getting the most use out of your fabric with the AccuQuilt GO. See how to use the innovative Qubes to make 72 different blocks perfectly and 90% faster, too! You'll also be introduced to the many ways to use strip dies. Managing your stash and scraps is a breeze with dies to cut your own fabric into standard pre-cut sizes quickly and accurately. You"ll see firsthand how fast and easy it is to cut detailed shapes for applique as well. Whether you have trouble rotary cutting due to physical challenges or you are looking for a better way to cut, this class is for you! Learn to use the BERNINA embroidery machine?s freearm, which provides you with more space when embroidering projects that are not flat. It makes it easier to create great looking embroidery even on a project with ?shape? and can be used with several BERNINA hoop sizes. Learn to use Endless Embroidery to help you line up embroidery designs for the most precise placement for multiple designs such as a borders. Endless Embroidery creates registration marks that are stitched that help take the fear out of re-hooping. Using Endless Embroidery is perfect for embellishing bed linens, table linens and more. Learn what you need to get started as you venture into this increasingly popular machine quilting technique. Rulers can open up a whole new world of free-motion quilting. As long as you can move the quilt under the needle, you can do rulerwork. The experienced machine quilter will find rulerwork techniques add interest to their free-motion skills. Make this sweet scrappy heart wall hanging with a modern twist. Learn Applique, embellishment with decorative stitching and stitch designer. This project is beginner friendly! Bus will leave Tuesday morning and come back Tuesday night. Then, off we go on Wednesday. Have you ever wondered how all those beautiful fabrics are designed and created? Have you ever wondered how Judy decides what fabrics to buy for Bears Paw? Have you ever asked why a store can't get more of a fabric that you didn't buy enough of? If you answered yes to any of the above, then you don't want to miss this presentation. Shirley Mandler, our fabric rep for Northcot, Benartex, Hoffman and more will be doing a presentation showing how fabrics are created, starting with the concept, to the printing, to delivery in the stores. Following this informative presentation, Shirley Mandler will show you fabrics that will be previewed at Spring Quilt Market the middle of May in Kansas City. This is your chance to be a buyer for a day. Which fabrics would you buy for Bears Paw if it was your decision to make? You will be seeing these fabric collections before most stores in the United States. Can you keep a secret?????? Following the preview of future collections, a trunk show will be shared with you of quilts using the Northcott fabrics, including the 10th Anniversary Stonehenge collection - Solstice. And... last, but certainly not least, there will be drawings for some great door prizes. So sign up today, seating is limited. NEW MACHINE - COMBI MODE, DIRECTIONAL STITCHING, ETC. This class is geared to the 5 series, 7 series and 8 series machines and covers features such as Combi-Mode, Muti-Directional stitching, and Stitch Designer. The Multi-Directional and Stitch Designer features does not pertain to the 5 series or the 740 and 770 machines so we will cover Combi-Mode first then multi-directional and stitch designer features. Those who do not have multi-directional and stitch designer are welcome to stay to see what these features are or may leave if you so desire. The BERNINA Stitch Regulator is an innovative accessory that is far more than just a presser foot...it is part of a dynamic interaction between quilter, accessory and BERNINA Sewing Machine. Come in learn the ins and outs of this incredible foot. Our classes are FREE to those who purchased from Bear's Paw, but we open our classes to anyone who has purchased their machine from another dealer for a $60 fee. This class is for 8 series, 7 series and 590, and 570 machines. We will go over all the basic functions of your new machine. And we will have fun exploring: Decorative stitching; Temporary Altered Stitch Memory; Altering stitches; Pattern functions; Memory and Alphabets, mirror image and other features and functions. If you had a one-on-one session with us prior to this class, you are welcome to take this class as a review. Class is FREE if purchased from Bear's Paw Fabrics but we welcome people who purchased elsewhere for $90. . Working with a unique composite material, Kraft-tex, we will make a notebook cover that is big enough to fit the composite notebooks. Kraft-tex is a paper product that you can wash and is very durable. Great to make for family and friends for the holidays.Try a new medium, Kraft-tex, making a notebook cover using the Hunter's Star quilt pattern. Kraft-tex is a leather-like product that is washable and easy to sew. 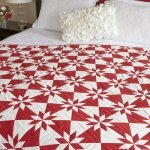 Have you tried freemotion quilting and just can not seem to get the results you want? This class is for you! You will learn all of the basics and beyond to start you on your way to successful machine quilting. CORNER POP AND 4 PATCH SQUARE UP (with optional Jen Kingwell ? Long Time Gone? quilt along) Instructor- Maria Rogers-Naito May 4th 10am-1:00pm. This class is running monthly, helping you improve your quilting skills on many popular units, covering a different technique each month. Some students are also working on Jen Kingwell?s Long Time Gone quilt, using the skills in this class to make perfect points and blocks in this sampler style quilt. Join us for a session, or for the rest of the year. In class we will make Bow Tie and Jacob's Ladder blocks. The Corner Pop is a tool and technique that will give you high success adding fabric corners to so many blocks giving you endless variations. Just look and the wonderful possibilities shown on the border of instruction leaflet below. The Four Patch Square Up tool gives you high precision for 12 different sizes. Your units will be the correct size. They will have seams properly positioned. And they will have edges that are straight, even, and square. Mastering perfection on this basic block will ensure better success as you put your quilts together. Try before you buy: we will have a few tools available to rent for $5, which will then be taken off the cost if you decide to buy that day. OPTIONAL - CONSTELLATION LEMOYNE STAR 37" X 37" Have you always wanted to make perfect Lemoyne Stars? In this class, learn how to easily and accurately piece traditional Lemoyne Star blocks. The block unites are strip pieced, and assembled without using any "Y" seams, pieced so that the blocks themselves are slightly oversized so at the end each can be trimmed to an exact size. The Rapid Fire Lemoyne Tool used in class makes Stars ranging from 3" to 12". Come to practice making Lemoyne stars as stand alone units or prepare and precut fabrioc to make this lovely wall hanging which showcases all the 10 sizes this one ruler can make. At the end of the class, you will be comfortable making perfect Lemoyne Stars. Maria will also show you 7 gorgeous Lemoyne Stars variations that can be made using the same ruler and the Studio 180 technique sheets. 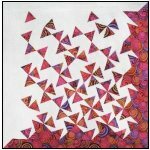 By combining two contrasting fabrics you will create triangles tumbling down the quilt. Using the Studio 180 V-Block tool, this quilt is fun and quick. Just jump right in and give it a whirl!. This quilt can be made in SIX different sizes! From 13" x 13" mini to a queen sized 80" x 80". It's your choice for the class. CHOOSE which size quilt you would like to make. Quilt Size: 13" x 13" - Dark Fabric: 1/3 yard, Light Fabric: 5/8 yard, Backing: 5/8 yard, Binding: 1/4 yard Quilt Size: 27" x 27" - Dark Fabric: 7/8 yard, Light Fabric: 1 yard, Backing: 1 yard, Binding: 3/8 yard Quilt Size: 40" x 40": Dark Fabric: 1 3/8 yards, Light Fabric: 1 3/4 yards, Backing: 2 2/3 yards, Binding: 1/2 yard Quilt Size: 53" x 53": Dark Fabric: 1 7/8 yards, Light Fabric: 2 1/4 yards, Backing: 3 1/2 yards, Binding: 1/2 yard Quilt Size: 67" x 67": Dark Fabric: 2 1/2 yards, Light Fabric: 3 1/4 yards, Backing: 4 1/2 yards, Binding: 5/8 yard Quilt Size: 80" x 80": Dark Fabric: 4 yards, Light Fabric: 4 3/4 yards, Backing: 7 1/3 yards, Binding: 3/4 yard I recommend pressing your fabric with Best Press or starch before cutting.